Hazel's method for course idea validation in full is a two-step process that involves both direct and indirect market research. We only focus on the indirect method. You'll have to tune in to the next Deep Dive episode to learn about her direct validation method. Hazel's indirect method leverages simple tools we use every day from Facebook to Amazon. Hazel June develops courses for entrepreneurs who are tired of trading their time for money. She helps them create a digital asset that brings in a passive scalable revenue stream. She started her online business recently in January of 2018, but she’s no rookie to the course game. Hazel has been building courses and developing training modules for over 10 years. 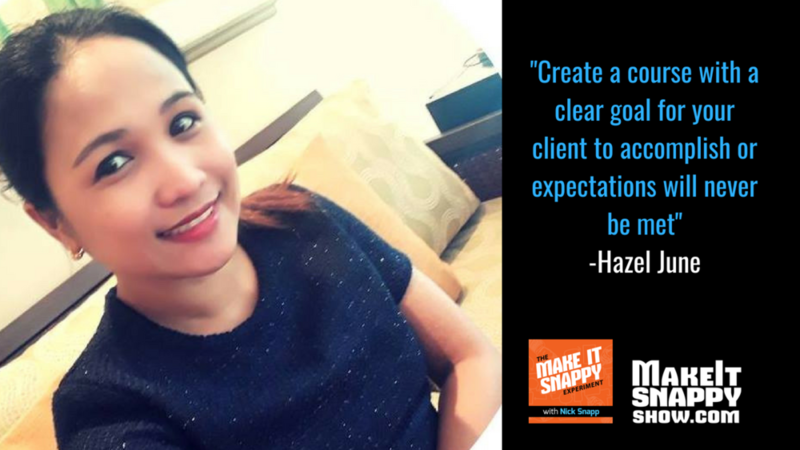 Previously, Hazel worked full time as a corporate trainer; now she uses that expertise to help entrepreneurs find freedom and live their best lives. To learn more about Hazel, you can visit her website, www.amhazeljune.com, contact her via email at hazel@amhazeljune.com or find her on Facebook. JOIN THE OFFICIAL FACEBOOK GROUP OF THE MAKE IT SNAPPY EXPERIMENT!